Apple CareKit, ResearchKit and HealthKit — Causeit, Inc.
Apple’s iOS, the operating system underlying the iPhone and iPad started as a closed system designed primarily for Apple’s purposes. Unlike the platforms of the 90s and early 2000s, which typically optimized for internal stakeholders of a large company, Apple started towards a newer model: a multi-sided platform. We'll take a look at how it creates new opportunities for patient care, health insights and research as a way to understand how platforms bridge organizations large and small to serve end users. A multi-sided platform (or MSP) like Apple's uses digital technology to create new outward-facing opportunities for all parties involved. In fact, ongoing relationships are one of the main hallmarks of a successful MSP, where the more users participate, the more value they get. For the company that develops and hosts an MSP, this may mean building closer relationships with customers and earning access to more data about them, as well as enjoying the shared revenue created by partners. For partners, value comes in the form of being able to create, distribute, and profit from products the develop on the MSP’s marketplace. And users receive value from the engaging with a constantly expanding set of apps on the platform, as well as by allowing data about themselves to be fed back to them in useful ways, such as recommendations. In 2015, Apple released their Apple Watch—a combination fitness sensor and wrist-sized smart device which linked to an iPhone. In the beginning, its features seemed primarily focused on delivering notifications from the smartphone to the user’s wrist, serving as a sort of bluetooth speakerphone, and delivering basic health data back to a user's phone. Despite a seemingly small feature set, by 2017—only two years after introduction—Apple was the number one watchmaker in the world. A 2017 video showing the many ways users have benefitted from the watch describes the ‘nudges’ the device gives about health and activity, the medical and fitness implications, and even a user who used the device to dial emergency services after a car accident threw his phone out of reach. Commercially, the Apple Watch and its competitors Android Wear devices, demonstrate that once a critical mass of users adopts a ‘swiss army knife’ smart device open to third party development, adoption spikes well beyond that of more proprietary devices (like indirect competitors Fitbit and Jawbone UP). And its standardized platform is now even enabling third parties to create regulator-approved medical devices using Apple Watch, like the KardiaBand, which provides high-quality EKG readings without a doctor’s visit. Health information had another potential use. Jawbone’s activity tracker and associated caffeine- and sleep-tracking apps were suddenly the biggest longitudinal study of caffeine’s interactions with sleep. The precision of smartphone-centric body trackers and the increasing willingness of end users to share raw data about themselves in exchange for meaningful insight meant that medical researchers who had long struggled to fund research of broad groups of people could also now, potentially, take advantage of the economies of scale afforded by Apple’s digital platform and the users and other platforms connected to it. To aid ethical, efficient and accurate research using iPhones and wearables, Apple introduced ResearchKit in 2015 with the hope of responsibly opening up more diverse populations for research. The platform standardized reporting of both quantitative data (like heart rate) and qualitative data, like patient stories or feedback. Several years later, the platform has been a limited success, validating the possibilities of digital platforms—but also reinforcing that there are few shortcuts to good researcher engagement with users. This brief video from Apple about ResearchKit and CareKit shows how research can change the global conversation about health and research. 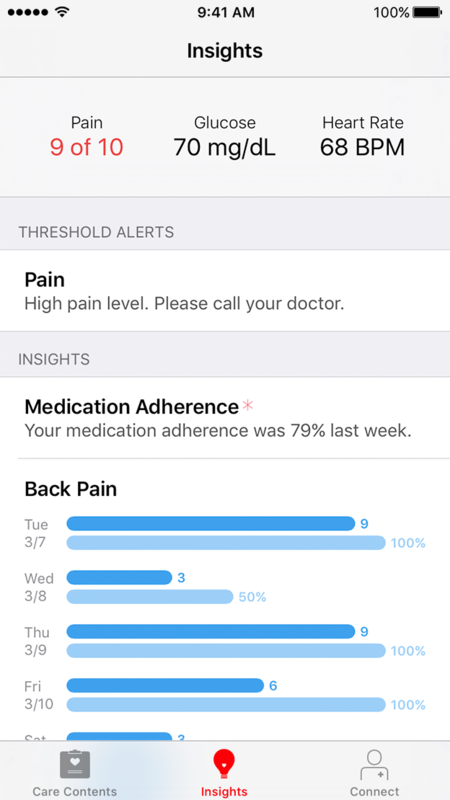 Roughly a year after release of the ResearchKit API and program, Apple introduced CareKit, a system which allows caregivers and patients to interact around a shared infrastructure. 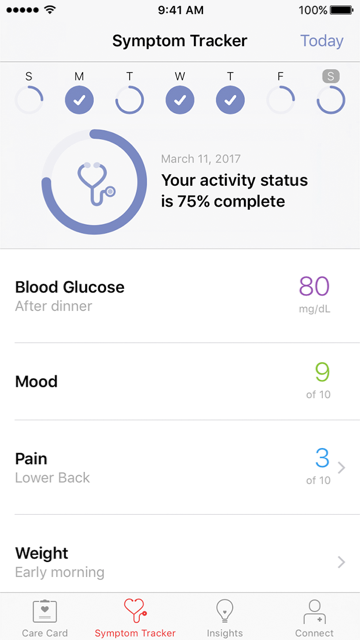 Apple cited users’ feedback that some of the most helpful components of ResearchKit was seeing insights into their health and communicating regularly with a research or clinician. Apple and its research partners noted that adherence to a care plan was one of the most difficult elements of care, especially after complex procedures like a surgery. CareKit and ResearchKit continue to expand as new use cases become apparent. This excerpt (watch from ~1:50 for a few moments) from Apple’s Worldwide Developers’ conference shows how Apple introduced the use case for CareKit to software developers, sharing some of the problems it can solve and integrating guidance around how best to serve end users. The combination of community, marketplace, infrastructure and data into a multi-sided platform like Apple’s means that developers—from small players with unique app ideas to big players wishing to quickly implement new, ‘digital’ offerings—can focus on what they do best and avoid the costly and frustrating process of developing their technology from scratch. Companies can look for software and hardware development kits like HealthKit, ResearchKit and CareKit as ‘indicator species’ of a groundswell of new opportunity to create digital offerings without having to carry all of the risk of such innovations themselves. End users will do the same—when they see investment from major firms like Apple’s, they can be assured there is a decent chance that the device or platform they buy into will continue to get more and more useful.